Most people say they want money so they can buy a home, send their children to college, travel and retire comfortably. Those are fine goals, but do you have a plan to get there? Or more importantly, do you realize that you could be achieving even more, given the right plan? 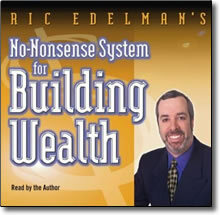 Ric Edelman’s No-Nonsense System for Building Wealth will show you not only a straightforward plan for achieving your financial goals, you’ll learn how to have fun and live an enriching life while doing it. Your goals and dreams will not get lost in a daily struggle just to earn a living and provide for your family. You’ll discover from Ric how easy it is to create wealth once you set the right goals. And as Ric will tell you in this program, all you need to be wealthy is to decide what you want to do with your money! With enticing, personal goals in place, you’ll motivate, excite and sustain yourself and your family in your quest for wealth. Using Ric’s plan to help you, you’ll embark on a detailed exploration of personal investing. Ric reveals his formula for creating a plan to build a solid financial future through his unique, time-tested investing strategies. You’ll hear countless testimonials about how others have used Ric’s guidelines to create a healthy, balanced and richly rewarding life. Does your financial plan make sense? Ric Edelman, one of the nation’s best-known and most successful financial advisors is on a mission — to replace the financial “non-sense” that abounds today and replace it with financial “un-common sense”. Ric calls his advice “un-common sense” because most people haven’t thought through their financial plans completely enough to see the errors that they may be making – errors that compounded over time could cost you hundreds of thousands of dollars in future wealth! In this program Ric debunks much of the hearsay and misconceptions in today’s financial advice community and gives you solid, structured. Proven financial advice to help you build a future that will give you financial peace of mind. Ric will teach you that much of this modern day “nonsense” actually “made sense” many years ago before our world was turned upside down by things like the internet, new taxes laws, plunging interest rates the instability of the stock market and a myriad of other influences. In this live seminar, Ric Edelman will give you an eight-point action plan that will tell you what you need to do right now in order to protect yourself and your family, your money, your income, your job, your home, your possessions, and your business. You’ll learn how to manage the powerful emotions that can cloud your financial judgment. You’ll also discover the guidelines necessary to make the right financial decisions that will secure your investments today and prepare you for the future. The new economy and the new millennium require a new set of rules. There is no one better to teach you these rules than Ric Edelman. Radically simplify your financial life and add more zeros to the end of your financial statements with the No-Nonsense System for Building Wealth.